Shopping for Twin Peaks Action Figures? In Twin Peaks, nothing is what it seems. From a town where everyone knows everyone and nothing is what it seems, in the middle of it all you'll find Agent Cooper! Based on the 1990s series, Funko puts their iconic spin on the memorable characters. 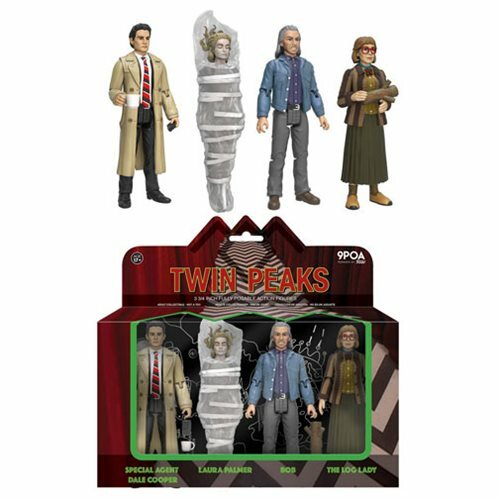 This Twin Peaks Action Figure 4-Pack includes Agent Dale Cooper, Laura in Plastic, Log Lady, and Bob with characer specific accessories. Each figure measures about 3 3/4-inches tall and features approximately 9 points of articulation. Packaged in a window display box. Ages 17 and up.